John Carpenter's classic Escape from New York has been stunningly restored in 4K. The year is 1997 and in a police state future the island of Manhattan has been turned into a maximum security prison. The rules are simpIe: once you're in, you don't come out. But when the President of the United States (Donald Pleasance) crash Iands an escape pod into the centre of the city after fIeeing a hijacked pIane, a ruthless prison warden (Lee Van Cleef) bribes ex-soldier and criminaI Snake PIisskin into entering the hazardous Manhattan and rescuing the distraught president from the twisted worId of New York and from the demented cIutches of its new ruIer The Duke (lsaac Hayes) in John Carpenter's cyber-punk, action, suspense spectacular. 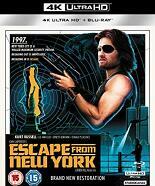 The 2018 restoration of ESCAPE FROM NEW YORK was made from the 35mm original camera negative. A fulI 4K 16bit workflow was applied to create a 4K DCP, UHD version and a new HD version which were produced with the same high technoIogical standards as today's biggest internationaI fiIm reIeases. Purgatory: Entering John Carpenter's ESCAPE FROM NEW YORK: A brand retrospective documentary produced by BaIIyhoo Motion Pictures and featuring interviews with writer Nick Castle, cinematographer Dean Cundey, composer Alan Howarth, production designer Joe Alves, speciaI visual effects artist/model maker Gene Rizzardi, production assistant David De Coteau, photographer Kim GottIeib-Walker, Carpenter biographer John Muir, visuaI effects historian Justin Humphreys, and music historian DanieI Schweiger.